The Bridgestone Tire group works with a lot of automobile manufacturers in Japan, Europe and across the Americas to develop tires that will be used as original equipment on new cars. Some vehicles that come with Bridgestone tires as original equipment are: Toyota Prius, Honda Civic, Accord and Fit, Toyota Yaris and Prius, Subaru Impreza and Outback, Nissan Sentra and Maxima, Pontiac Vibe, Acura TL and many others. Bridgestone Tire is always looking for new ways to collect, reuse and recycle tires, and it is with that mindset that they develop energy-efficient tires. The Ecopia series enables reduced fuel consumption and has a longer-lasting durability. Bridgestone Tire released the Blizzak WS 70, a winter tire that offers excellent and good traction on ice and snow, respectively. Similarly to the previous model (Blizzak WS 60), the Blizzak WS 70 suits cars and SUVs of some sizes. The Blizzak DMV1 and Blizzak W965 from Bridgestone are designed for vans, pick-up trucks, 4x4s and jeeps and offer a good alternative for traction on snow. LT and A/T tires will be accepted in Quebec during winter until 2014. Therefore, all Bridgestone Dueler A/T tires are allowed for jeeps, pick-up trucks and 4x4s during winter. Bridgestone Blizzak is a studless winter tire originally developed for Japan during the 1980s in order to answer growing environmental concerns over studded tires. Most Bridgestone Blizzak tires use a double composite—Multicell and winter composites. Multicell is composed of thousands of microscopic cells, much like pores which remind the texture of Swiss cheese when observed through a microscope, thus creating thousands of gripping particles that cling to the road. Bridgestone Tire offers a large range of summer and all season tires designed for all types of road vehicles: sedans, station wagons, sports coupes and SUVs. Bridgestone has different models of summer and all season tires that are known for their good durability and traction in wet and dry conditions. 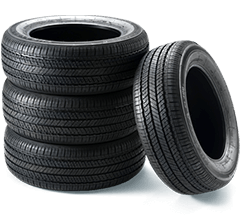 Bridgestone offers good quality all season car tires like the Turanza EL400 and the environmentally-friendly all season tire, the Ecopia EP 100. 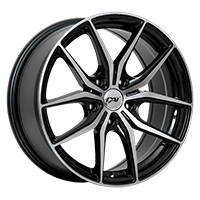 They also have all season tires for sport utility vehicles, such as the Dueler H/L 400. The Bridgestone summer car tire category includes: the Turanza ER30 and the Turanza ER33, both available in different sizes. Bridgestone offers a complete range of tires for trucks, vans, pickups and jeep 4x4s for all uses. Bridgestone has all season tires for long hauls, city driving, commercial use, off-road driving, and also summer performance tires for light trucks. Bridgestone tires for on-road use, like the Dueler H/L Alenza and the Radial Dueler H/L 400 offer good durability. Bridgestone off-road tires offer excellent traction in difficult conditions. The Dueler A/T Revo 2 and the Dueler A/T D695 are good mud tires and fare well on rocky terrains, making them the perfect choice for truck, pickup or jeep 4x4 drivers. Bridgestone tires are original equipment on the following vehicles: Honda Odyssey and CRV, Toyota Sienna, Tacoma, Tundra and Rav4, Nissan Pathfinder and X-Trail, BMW X3 and X5, Audi Q7, Porsche Cayenne, Mazda CX7, Chevrolet Avalanche Silverado, and many more. Bridgestone specializes in manufacturing tires for all types and models of trucks. The Dueler and Duravis tires are great on different terrains and for different uses, whether commercial or recreational. Bridgestone creates jobs in Canada. The textile factory in Woodstock (Ontario, Canada) makes nylon threads, resin and woven tire cords. The tire factory in Joliette (Quebec, Canada) produces 15,000 tires a day. Since 2008, Bridgestone has supplied all F1 teams with the Potenza tire and has won numerous prizes, particularly with Ferrari and Williams. Bridgestone Tire is very involved with car racing at many different levels. The company has its own driving school, called the Racing Academy, where you can take your first laps around the track in the city of Pontypool, Ontario, Canada. Bridgestone tires are original equipment on the following car models: Nissan 350Z, Subaru WRX, Audi A6 and A8, BMW Z8, Honda S2000, Porsche 911 Boxster, Ferrari, Aston Martin and many others. Bridgestone Tire has a complete range of high-performance summer and all season tires with excellent traction in wet and dry conditions. Bridgestone high-performance summer and all season tires are great for cars and, in certain sizes, for sport utility vehicles and pickup trucks. Bridgestone offers high-performance summer tires, like the Potenza RE-11 and the Potenza RE760 Sport for cars, and the Dueler H/P Sport for SUVs. Summer performance tires offer better traction than all season performance tires, but tend to be a bit less durable. Bridgestone also offers high-performance all season tires like the Potenza G019 Grid and the Potenza RE92, both are efficient in temperatures as low as -7 degrees Celsius and are more durable than high-performance summer tires.